I am back from a very productive trip to China. It was fast and grueling trip but worth it. I have a BAT! A Fledermaus? 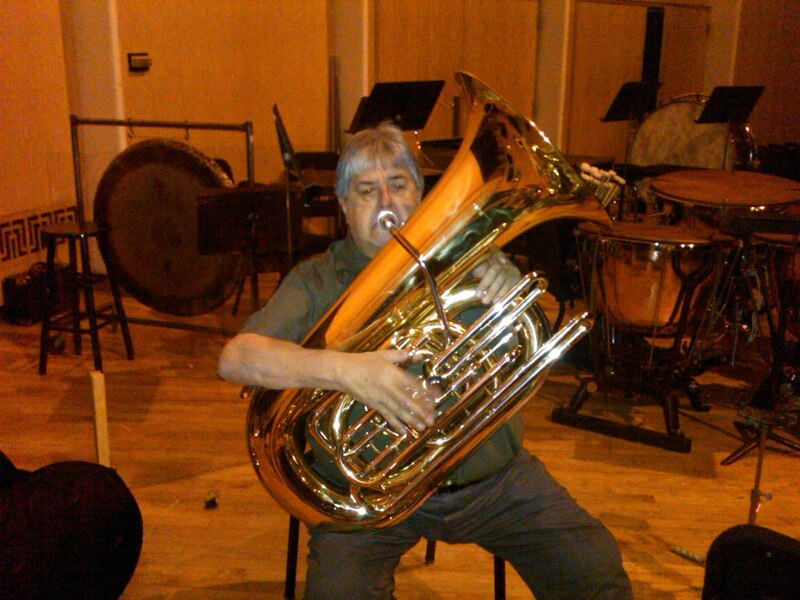 A Big Audacious Tuba. In fact I have two BATs in CC and two BATs in BBb, each available in silver or lacquer for a total of eight. Pictures posted in links. In keeping with the old system, J=tubas, digit one = scale degree, digit two is size and digit three is number of valves. So: J-865LQ is CC 5v, J-865SP is CC 5v, J-864LQ is CC 4v, J-864SP is CC4v, J-765LQ is BBb 5v, J-765SP is BBb 5v, J-764LQ is BBb 4v and J-764SP is BBb 4v. 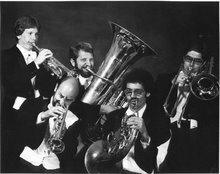 The instruments are not copies of any existing tubas but were certainly inspired by some great American tubas of yesteryear. (Return with us now to those thrilling sounds of yesteryear…) The point of departure was a BBb Holton from the twenties. I used the bell, bow and branches for the BAT dimensions. It is clear to me that Frank Holton and J.W. York had a symbiotic relationship and that is was Frank Holton that first developed the large bell that was later used by York. The valve cluster is that which I currently use in the 4/4 tubas so the bore is .750/.787 with an optional dependent fifth rotor. Because of the dependent rotor I could not tell a blowing difference or sound between the four and five valve models. Having owned BATs with 20” and 22” bells and having compared the Conn 52J, 54J and 56J, I am keenly aware that too big a bell makes the sound diffuse and fluffy whilst too small a bell offers little depth but gives a quicker response especially in the low register. I chose 19” for these BATs and am confident most everyone will like the choice. I brought back with me one J-865UL and will use it as a trial sample for anyone who wants to test it. In Elkhart by appointment or at a conference near you. I will be traveling with a Gemeinhardt display to several shows, bringing along a variety of BMB tubas. Give me a shout if there’s something in particular you’d like to try. 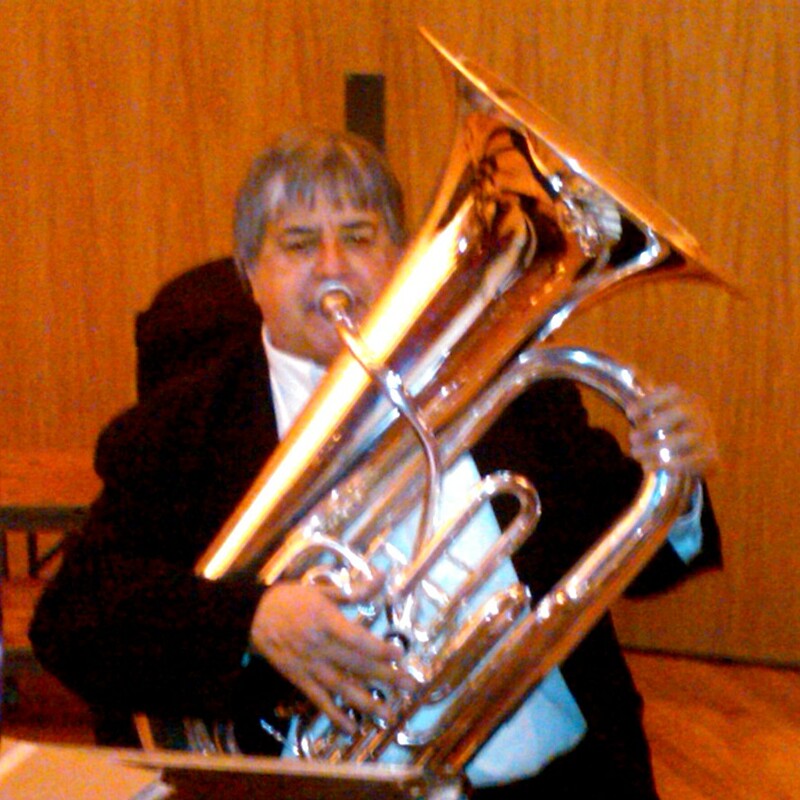 I will be in Ames, Iowa for the state convention Nov 15-17, New York State’s NYSSMA Nov 29-Dec 1, Wright State’s Low Brass day Dec 8, Midwest in Chicago Dec 19-21. 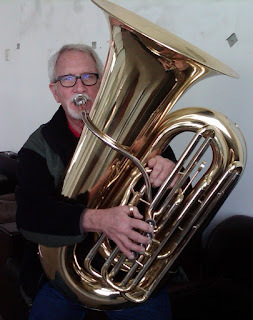 Grand Rapids, Michigan Jan 17-19, Capital Tuba Conference in DC Feb 1&2, Ohio MEA in Columbus Feb 7-9, NAMM in Anaheim Jan 24-26 Minneapolis Feb 14-16, TMEA in San Antonio Feb 14-16 will have tubas but I will not be there. I would be pleased to do a complete display of all my tubas and Euphoniums at your college. Email me at bigmouthbrass@gmail.com. It is my intention to keep one each of the BBb’s and take orders as I have no feel for whether 4v or 5v in LQ or SP will be popular. I expect February delivery of 5v CC’s in both lacquer and silver and will secure orders with deposits. Oh, the price, around $7,000 depending on specific model. Includes a free case and a great Helleberg mouthpiece. Gig bag available. I will withhold personal evaluation here, but I am extremely encouraged by what I could tell with my dystonic (is that a word) chops. 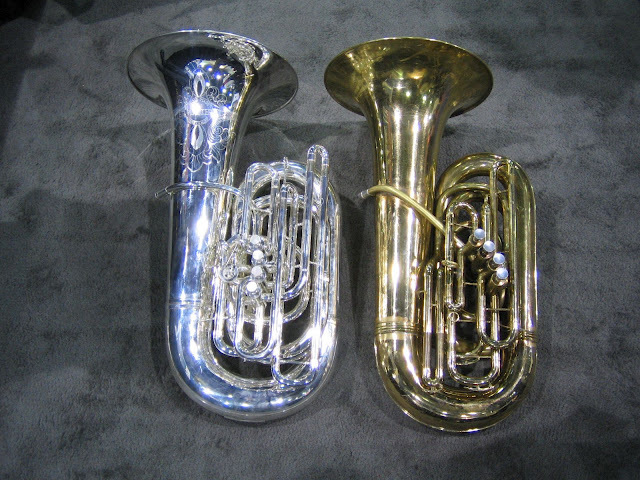 If you would like to try the J-445 F tuba or the proto-type of the CC tuba, I will be displaying these, as well as the full line of Gemeinhardt horns, Euphoniums and trombones (and of course the flutes and other woodwinds), at the Pennsylvania Music Educators' Convention. This year the convention is in Lancaster. Exhibit Hall Hours: Thursday, April 19, 9:30 a.m. - 6:30 p.m., Friday: 8 a.m. – 4 p.m. 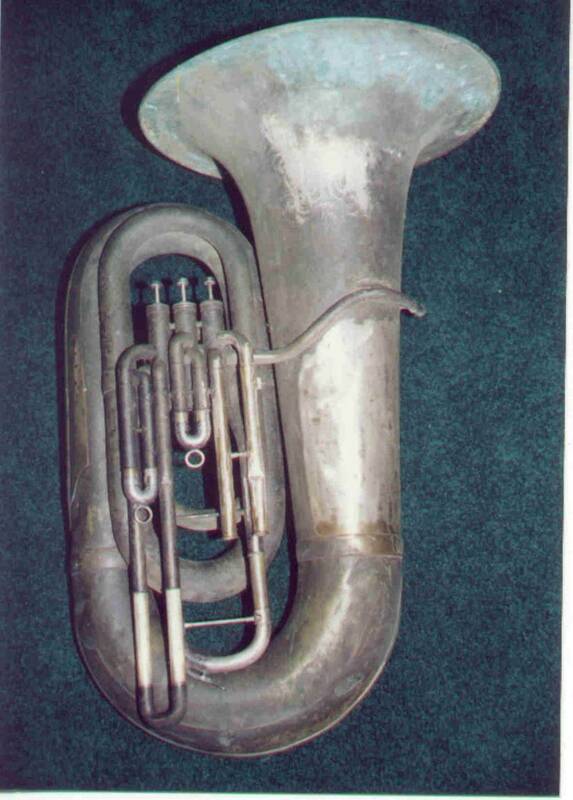 I would really appreciate some input on the I-808 Compensating Euphonium. I will have TWO versions at PMEA. March has been an action packed fun filled month of adventure, excitement, disappointment and more excitement. 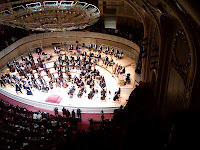 The first weekend I went to Chicago and heard Gene Pokorny play Das Lied von Erde on my Gemeinhardt F tuba. A week later I was off to Cleveland where Ron Bishop and his students tested the F for purchase at the Cleveland Institute. 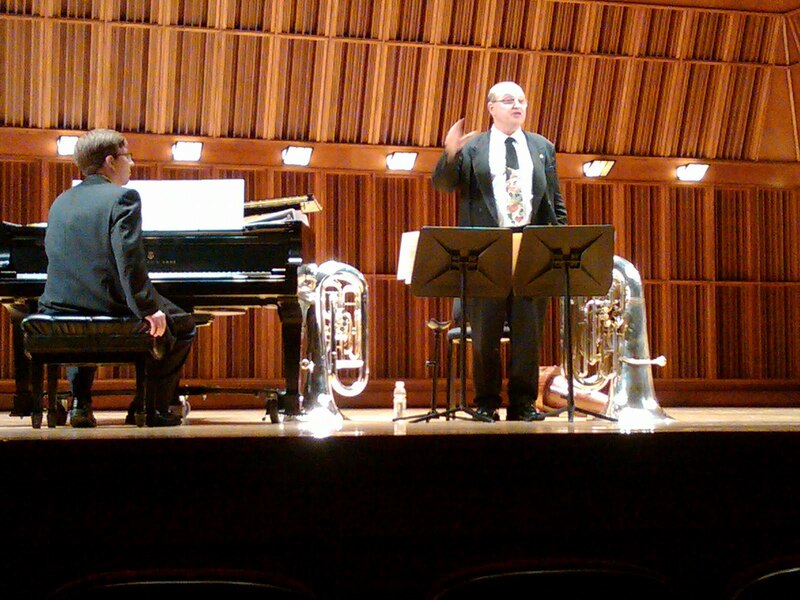 Then down to Muncie, IN where Gene Pokorny played a recital at the invitation of tuba instructor Mathew Lyon. 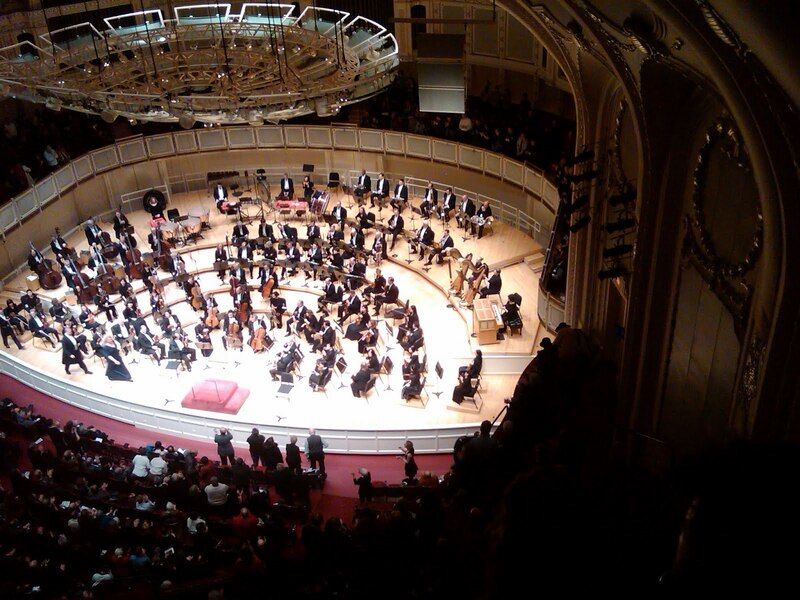 Mr. Pokorny played ‘my teacher’s old York, LOL, aka ‘the’ York, as well as my Gemeinhardt F. More on that later. Then off to China to see the sample of the J-845 CC tuba. This is where the disappointment came in. It wasn’t ready. But we ironed out some design details, started a new mouthpiece to include with the tubas, started design of a 6/4 tuba and have a production schedule for the J-845, J-844 and J-744 tubas. 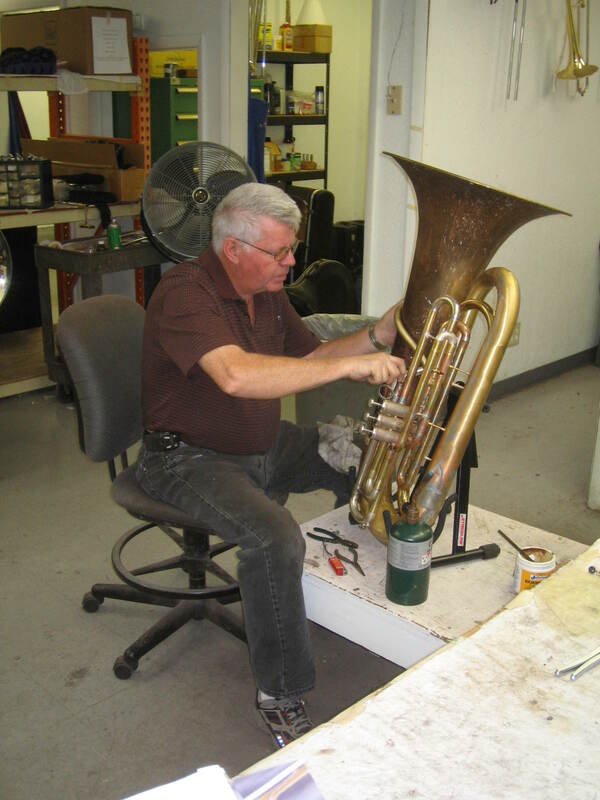 I also did some design work on an ergonomic Euphonium and approved new rotors for our French horns and worked with the trombone slide maker. 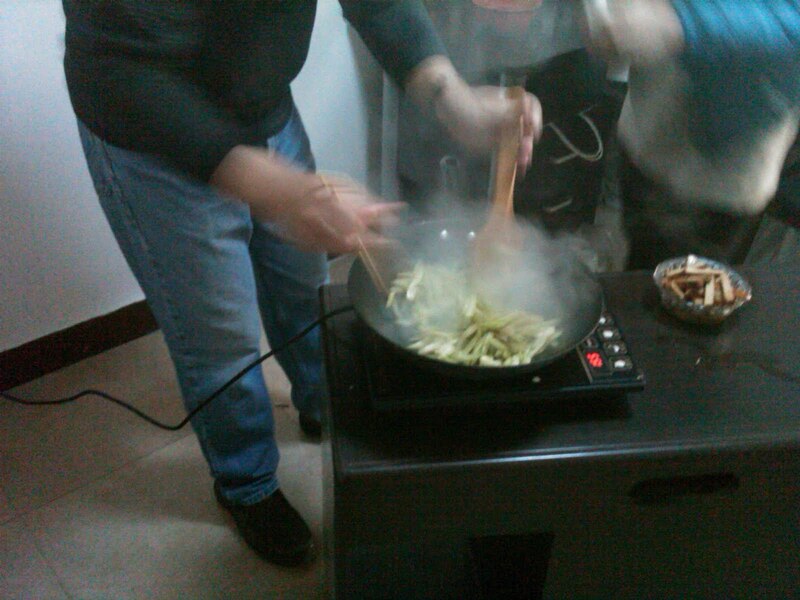 Knowing I am a vegan, my host treated me to a vegetable stir fry at the factory. Wok this way. Pictures attached. See March 2012. 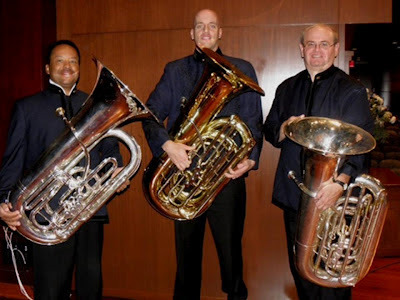 Update on the BBb and CC tubas. The full size J-744 big BBb sample tuba will be done April 30 and in US by May 15 for approval. 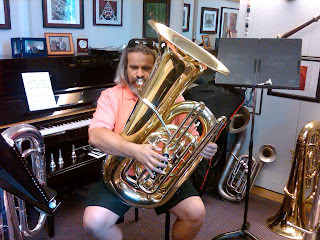 The full size J-844/845 big CC tuba sample will be done May 15 and in US by June 1. If samples are approved, production instruments will be in U.S. approximately August 1. I did play test the ¾ CC tuba and loved it. ¾ is for sure an inadequate description. The bore is .730” which makes it larger than a 36-J. The bell throat is as large but flairs only to 16” making it more a compact tuba than true ¾ tuba. 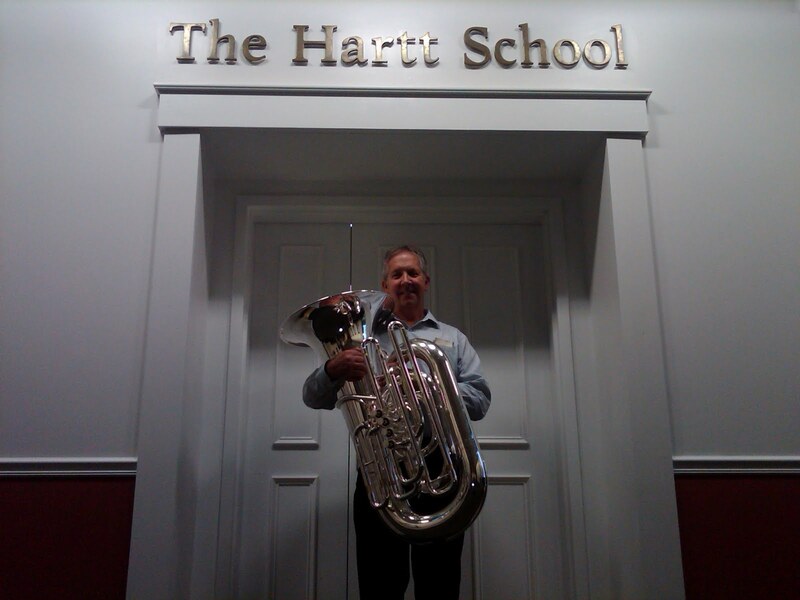 This is by design in part so that the BBb version matches school bid needs for a middle school tuba. The CC is more open as you would anticipate. Available in 4 or 5 valves in silver or lacquer, I have one on the way to test the waters. This one will be 4 valve lacquer. Street price in this configuration is only $4303. It believe it will be a perfect solo and quintet tuba large enough to hold its own in most large ensembles. I hope you can try one and give me input about its potential. BTW it fits in a small MTS case making it a great travel tuba. More F tubas and EEb tubas are in production. I still expect them in late April or May. 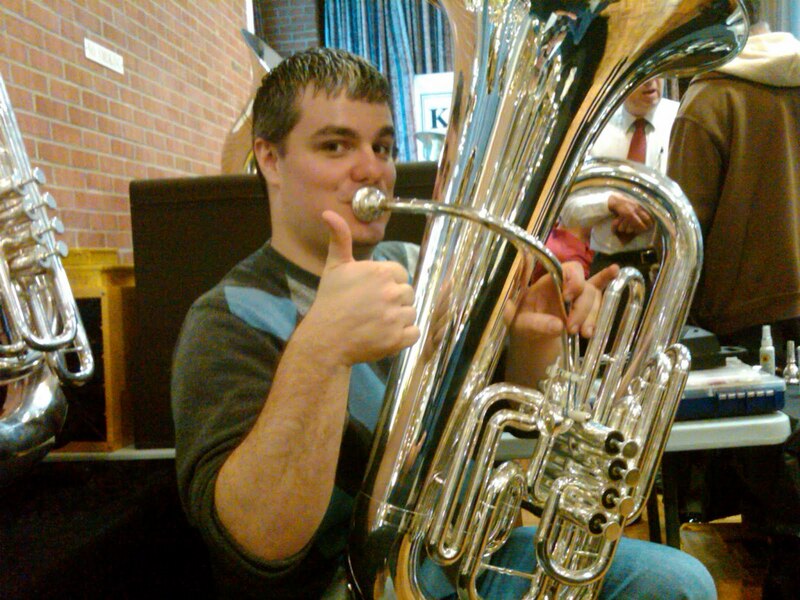 There are two more F tubas due in today. We are already backordered! If you are planning to get one, it would be wise to get a deposit in. 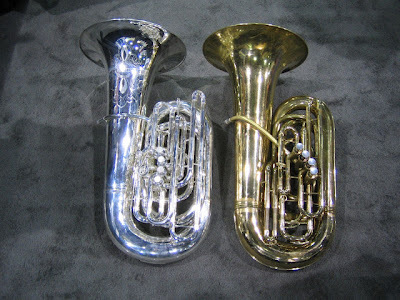 A dealer in Mesa AZ has some on order and a dealer in Granger IN has spoken for any available stock of F and EEb tubas. Email me if you need more info. I am glad to be back home after five shows in six weeks. I was glad to be in the warm weather of Florida. I enjoyed California except for getting a case of Nammthrax stomach flu. My ears have almost recovered from the room full of tubas in D.C. Texas did not disappoint and it was great to see some old friends. Ohio was like a homecoming for me. I am truly overcome by the response to the new tubas. I was confident they would be good but the response has been beyond my expectations. I am thrilled by the great players that have taken the time to try them and by the positive comments they have made. I have asked the factory to increase production. I learned a good deal about the needs of Euphonium players. It appears the I-808 has great acoustics but will need some ergonomic changes to accommodate the majority of players. 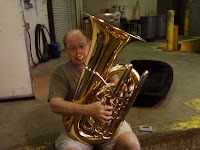 I am planning a trip to the factories in China at the end of March to oversee the large tuba production and make the necessary tweaks to the Euphonium. I was also gratified that more players are noticing our excellent French horns and trombones. The next big show will be PMEA in April. along with the innie/outie Euphonium and the rest of the Gemeinhardt brass. 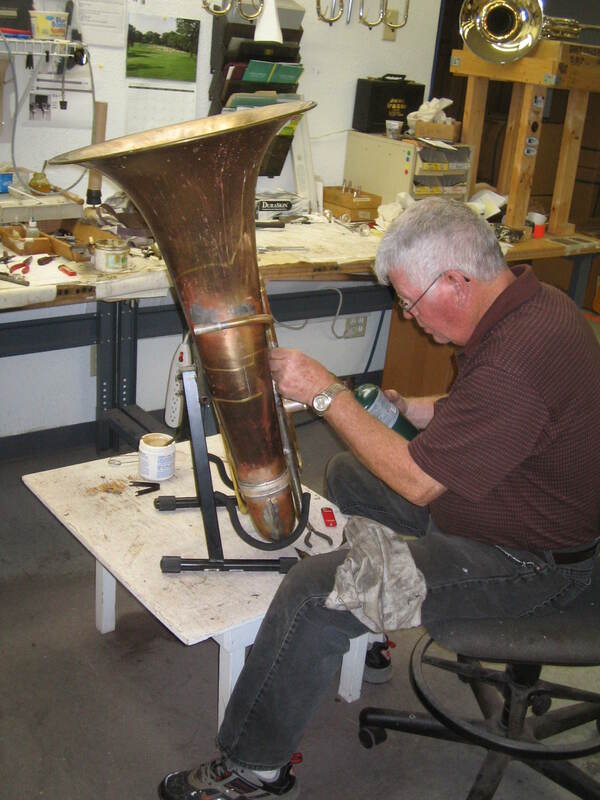 Yes we make Horns and Trombones too! Then Columbus, Ohio - February 16-18.